Packers WR Greg Jennings was having a little fun with the media at Bears WR Brandon Marshall’s expense on Thursday. A day earlier, Marshall challenged Green Bay’s defensive backs to cover him one-on-one, and he took exception to the characterization that any Packers DB shut him down during his two-catch performance in Week 2 because whoever was guarding him had plenty of help in other areas of the field. Recognizing how absurd it would be to devise a game plan that would involve covering Marshall man-to-man when Marshall has 101 receptions for 1,342 yards and the next-closest Bears in each category have 36 catches and 256 yards, Jennings “challenged” the Bears defense to do the same against Green Bay’s receivers. Once the laughter around his locker had subsided, Jennings acknowledged that Marshall was obviously trying to fire up his team and possibly get into the heads of the Green Bay secondary. WR Greg Jennings took another step toward possibly returning to game action this week when he practiced in pads during the media portion of Thursday’s workout. Thursday is the regular day when the Packers practice in full pads. Also, LB Vic So’oto, who missed Wednesday’s practice due to illness, returned to practice. Both Mike McCarthy and Jennings commented after practice on the progress being made. McCarthy said Jennings took reps in the team (11-on-11) periods both with the regular offense and the scout-team offense. Jennings confessed the decision on whether or not to play is ultimately out of his hands, but he’s giving whatever “input” he can by doing what he’s doing on the field. WR Greg Jennings ran a few routes in the jog-through segment of practice and did some receiver drills during the portion of Wednesday’s workout open to reporters. It’s the first time Jennings has been involved in practice since Week 4. He had surgery on an abdominal/groin muscle a few weeks ago and has only played in three games this season. Also on the practice field on Wednesday were NT B.J. Raji, who limped off the field late during Sunday’s victory in Detroit with an ankle injury, and TE Andrew Quarless, who sat out two practices last week due to his knee. Not practicing on Wednesday during the media portion were DB Charles Woodson (collarbone), CB Sam Shields (ankle), LB Clay Matthews (hamstring) and LB Vic So’oto, who was not on the injury report last week and played in the Detroit game. Mike McCarthy will speak with reporters following practice at the top of the hour. FB John Kuhn, who has missed the past couple of games with a hamstring injury, was back on the practice field on Wednesday. LB Clay Matthews and DE Mike Neal, however, were not practicing in the portion of the workout open to the media. CB Charles Woodson and WR Greg Jennings continue to sit out as well. Mike McCarthy will address reporters after practice at the top of the hour. WR Greg Jennings declared himself “pain-free” on Monday, about 11 days following surgery on an abdominal muscle, but he’s not announcing any timetable for his potential return. Jennings said he hasn’t been pain-free in his abdominal area since originally sustaining the injury in the fourth quarter of Week 1 against San Francisco. He sat out Week 2 against Chicago, then played in Week 3 at Seattle and again in Week 4 against New Orleans before leaving that game midway through. He hasn’t played since. As he did before the surgery, he sounded confident he would return this season, but he’s just not interested in saying when. In other injury news, LB Desmond Bishop spoke with reporters on Monday and said all is going well with his rehab. Bishop was lost for the season in the first preseason game due to a hamstring injury that required surgery. In the meantime, Bishop said he’s been impressed with his current replacement, Brad Jones, who took over when Bishop’s initial replacement, D.J. Smith, was also lost for the season to injury. 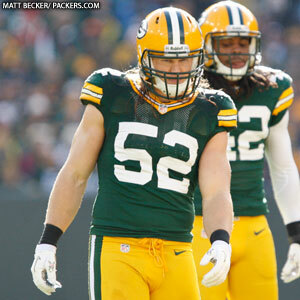 Jones originally came to the Packers in 2009 as an outside linebacker, but Bishop said he could see even then that Jones was a bit of a natural inside. 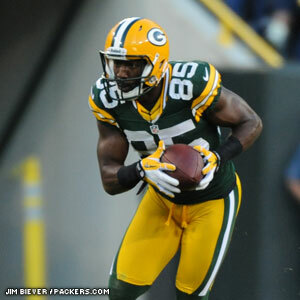 WR Greg Jennings had surgery on his abdominal muscle on Thursday, Mike McCarthy confirmed, two days after it was originally scheduled. Jennings had the procedure done in Philadelphia, where the specialist he visited last week resides. His surgery was postponed two days due to the East Coast storm. McCarthy said he was told Jennings would be out a minimum of a couple of weeks. Jennings has not played since Week 4 against New Orleans. “The procedure went very well,” McCarthy said.